We spent 24 hours in Oxford last week – there primarily to see Cezanne and the Modern, the current exhibition at the Ashmolean. Somehow, I’ve reached retirement age without ever having been to Oxford before, so we spent time strolling through the streets of the town and ambling along the shaded path that lies between the Cherwell and Christ Church Meadow. I was quite taken aback by how much Oxford conformed to what I had assumed was a clichéd image I had of the town: you know – young people punting lazily along the Cherwell, drinks in hand; bicycles everywhere, left leaning against walls and railings; the honey-coloured Cotswold limestone of the buildings. Two of the most memorable places we encountered on our meanderings were the Botanic Garden (above) and the Bodleian Library. 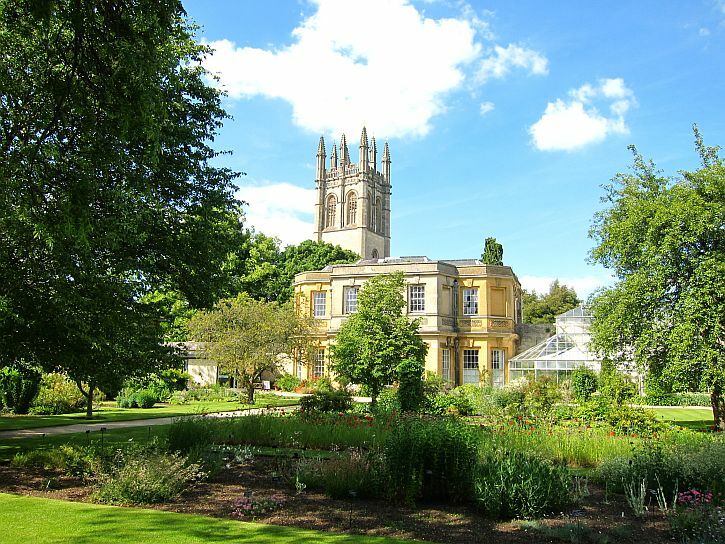 The University of Oxford’s Botanic Garden is Britain’s oldest, founded almost 400 years ago, when the first Earl of Danby donated £5000 to start a ‘physic garden’ to grow plants that would support medical practice. From the beginning the garden was intended to be, in Danby’s words, ‘for the glorification of God and the furtherance of learning’. Danby might have been motivated to appease the almighty by having, thirty years earlier at the age of 21, murdered a man in a long-standing feud between families. A site for the garden was chosen on the banks of the River Cherwell at the north-east corner of Christ Church Meadow. The land belonging to Magdalen College, part of it having been a Jewish cemetery until the Jews were expelled from Oxford (and the rest of England) in 1290. 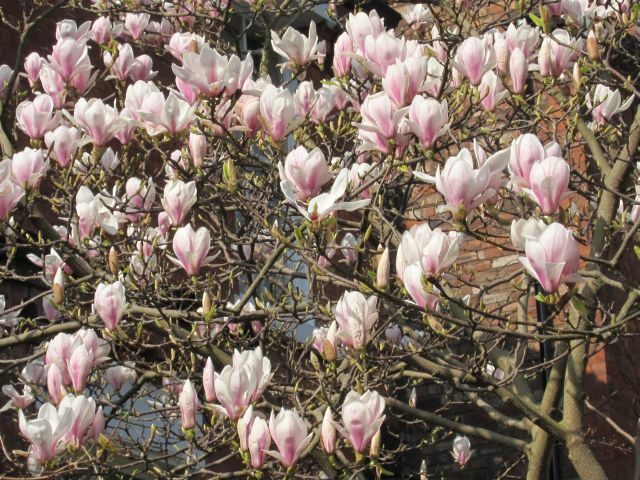 The garden, established for ‘the furtherance of learning’, continues to support scientific enquiry and understanding, but is also a place for taking aesthetic pleasure in nature, or for quiet contemplation. Undergraduates studying biological sciences at the university visit the garden to learn about many aspects of plant biology, while thousands of school children visit the garden each year as part of the university’s schools education programme. Strolling around the rectangular ‘family beds’ where plants are grouped according to their botanical family, geographical origin or uses, we occasionally came across signs that described the investigations currently going on in a particular section. The garden is home to more than 5000 plant species – on less than five acres of land, this makes it, according to the guide we were given, one of the most biodiverse places on Earth. 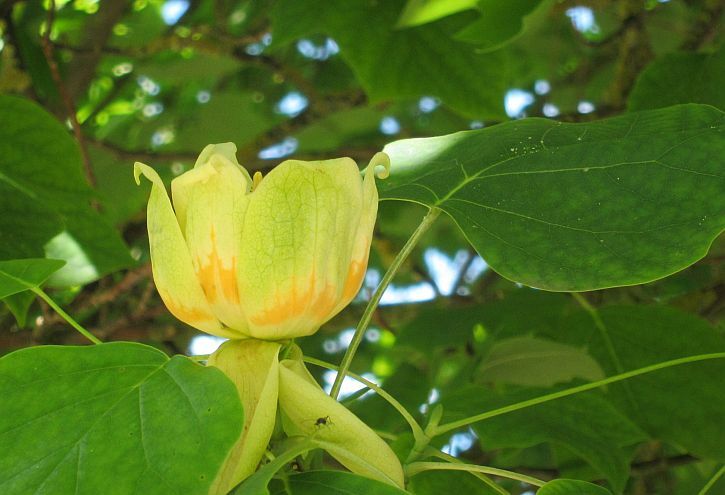 In addition to colourful flowerbeds, there are sections where herbs and vegetables are grown, and – dispersed throughout the garden – some very interesting and beautiful trees. One tree survives from the original 16th century planting – an English yew, a species, as a label informs, that today is the source of drugs used to treat breast and ovarian cancer. 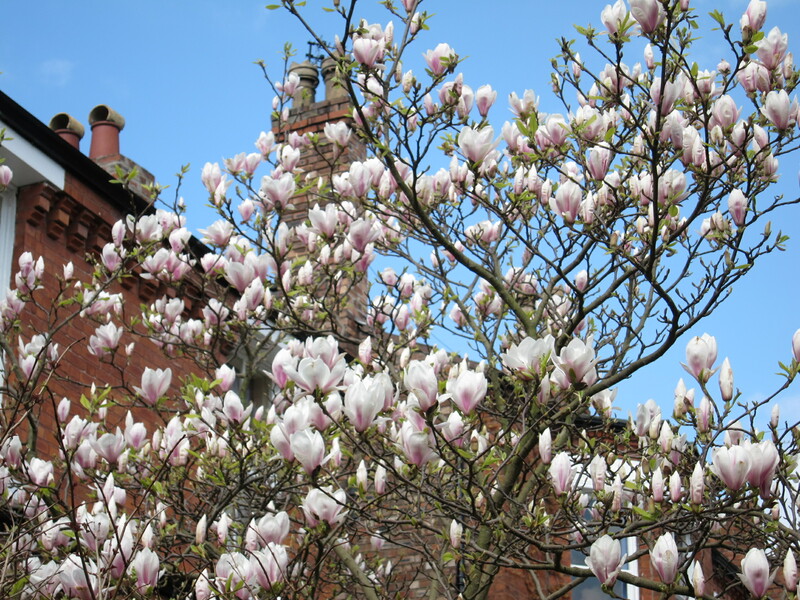 There is a Gingko, a Monkey Puzzle, and a Tulip tree with beautiful blossoms that look like tulips, though the plants are not related. 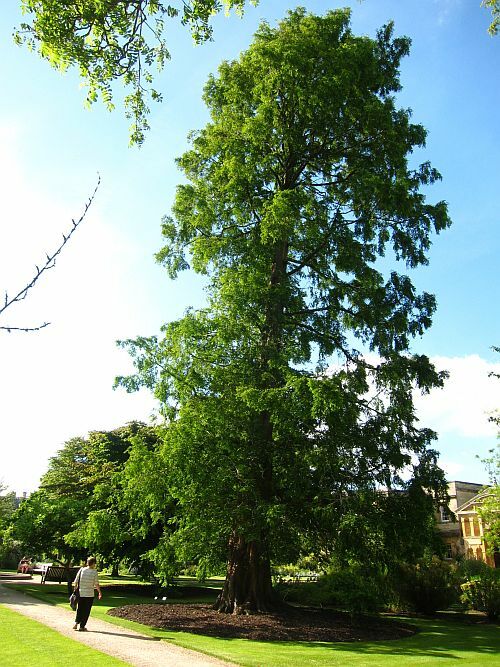 Most dramatic was the towering Dawn Redwood (Metasequoia glyptostroboides), a tree known only in the fossil record until several living ones were discovered in China in the 1940s. This one was planted in 1948, so is my age but a little taller. Then there is the Black Pine. I love pines, and this one reminded me especially of one of my favourite Cezanne paintings, ‘The Great Pine’. But this tree has literary, rather than artistic associations. Indeed, the garden is rich in literary associations: Charles Dodgson, better known as Lewis Carroll, would bring the children of Henry Liddell, Dean of Christ Church (including Alice), for picnics in the garden. 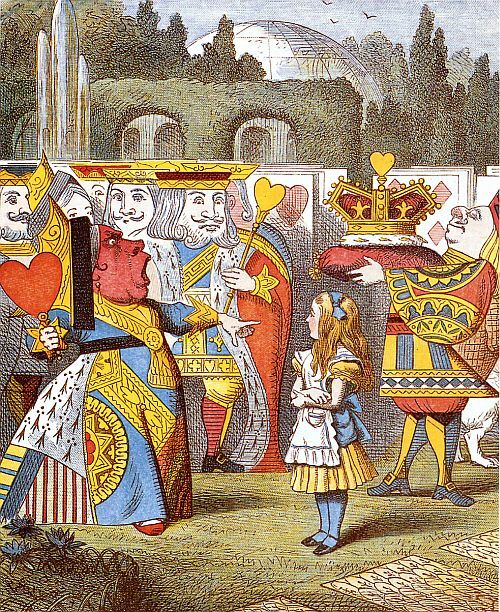 In John Tenniel’s original illustrations for Alice in Wonderland the garden’s water lily house can be seen in the background of one of the plates illustrating the Queen of Heart’s Croquet Ground. 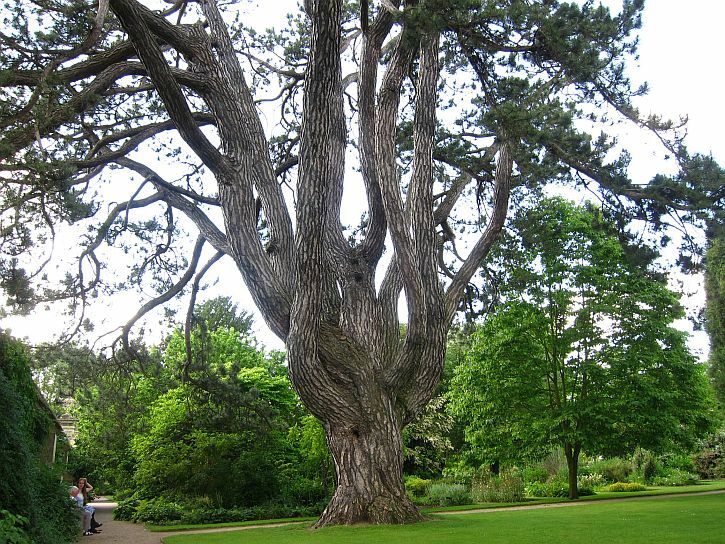 The Black Pine, brought here as a tiny seed in 1795, was the favourite tree of Oxford professor and author, JRR Tolkien, who often spent hours in the garden sitting under this tree. The tree is also a favourite of another Oxford-based author, Philip Pullman; he so loves this tree that he has Lyra, the heroine of His Dark Materials, sit under it tree at the conclusion of the trilogy. In his story, a bench beneath its spreading branches is one of the locations where the parallel worlds inhabited by the protagonists, Lyra Belacqua and Will Parry. In the last chapter of the trilogy, both promise to sit on the bench for an hour at noon on Midsummer’s day every year so that perhaps they may feel each other’s presence next to one another in their own worlds. “Yes. Of course! And they would have come with us. Her hands were resting on his glossy fur. Somewhere in the garden a nightingale was singing, and a little breeze touched her hair and stirred the leaves overhead. All the different bells of the city chimed, once each, this one high, that one low, some close by, others further off, one cracked and peevish. another grave and sonorous, but agreeing in all their different voices on what the time was, even if some of them got to it a little more slowly than others. 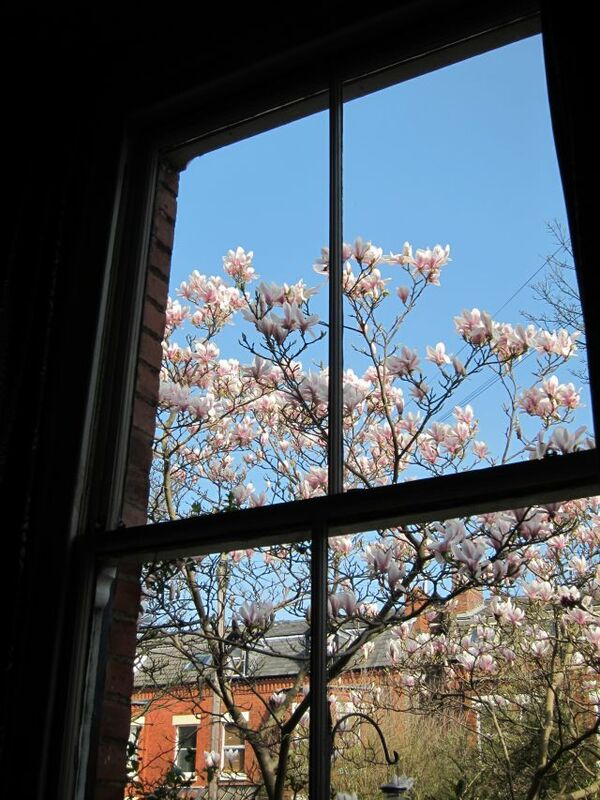 In that other Oxford where she and Will had kissed goodbye, the bells would be chiming too, and a nightingale would be singing, and a little breeze would be stirring the leaves in the Botanic Garden. Earlier we had drifted into the quadrangles that enclose the Bodleian Library, the main research library of the University of Oxford, and one of the oldest libraries in Europe. In Britain it is second in size to the British Library, containing over 11 million items. In its current form the library has a continuous history dating back to 1602, though its roots can be traced back even further. 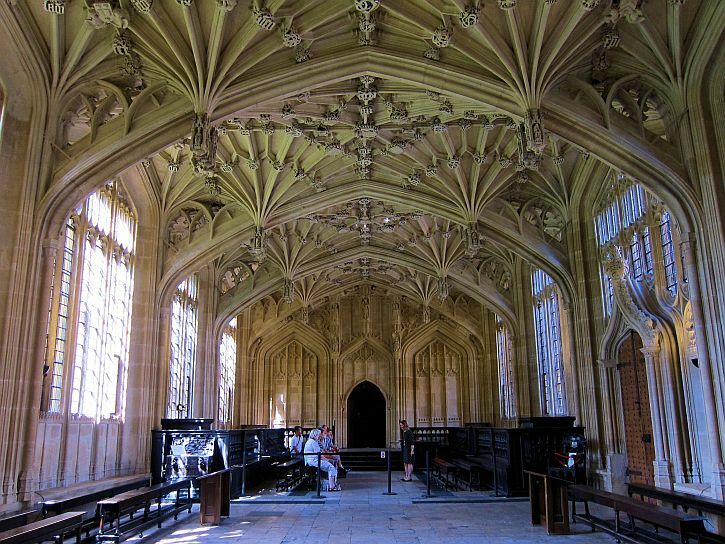 The first purpose-built library known to have existed in Oxford – a small collection of chained books – was founded in the fourteenth century by Thomas Cobham, Bishop of Worcester. Thomas Bodley was the son of a Protestant merchant family from Exeter who had studied under Calvin in Geneva – a Protestant exile in the reign of Queen Mary- before returning to England when Elizabeth came to the throne to study at Merton College) In 1598 he wrote to the Vice Chancellor of the University offering to support the development of the small existing library. The library expanded rapidly, with the Schools Quadrangle – where we had entered – being added between 1613 and 1619. 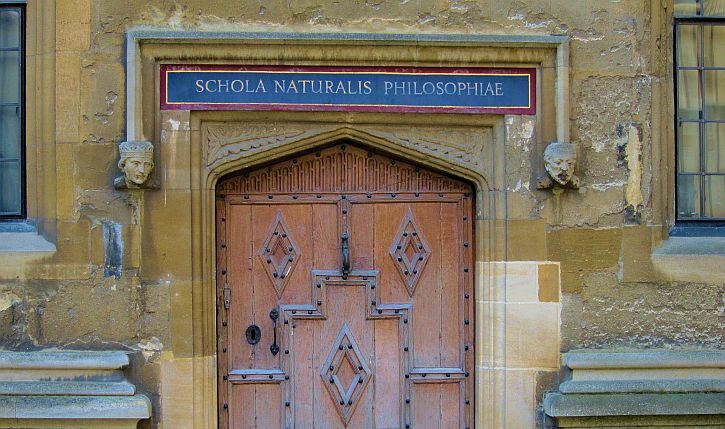 Doorways leading off the quadrangle are labelled with the names of various disciplines and I was interested to note the entrance to the School of Natural Philosophy. Only a week before I’d heard Melvyn Bragg’s panel on In Our Time discuss the work of the pioneering scientist Robert Boyle – one of the first to conduct rigorous experiments to lay the foundations of modern chemistry. Leaving the quadrangle, we came face to face with a circular building constructed from the local honey-coloured limestone. This was the Radcliffe Camera, designed by James Gibbs in neo-classical style and built between 1737 and 1749 to house the Radcliffe Science Library. 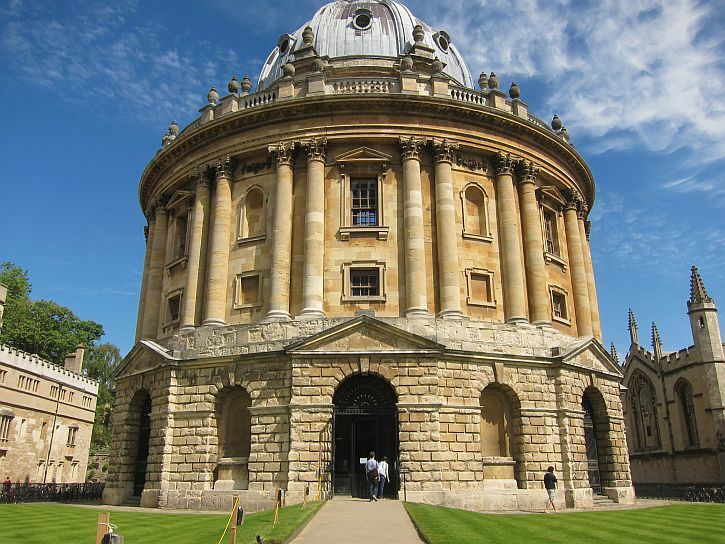 Known as the Radcliffe Camera (camera, meaning ‘room’ in Latin), it was taken over by the Bodleian in 1860, as the library grew short of space. On a warm afternoon, we strolled the sun-dappled path alongside the Cherwell, as students punted past us in celebratory mood. Where the Cherwell meets the Thames we sat and watched teams of rowers as they practised on the Thames, the shouts of their cox’s splitting the air. Later we enjoyed a drink at the waterside pub by Folly Bridge, The Head of the River. Then over the river to The Folly restaurant for a delicious meal on the terrace as the sun set on a balmy evening. On our way back from Stratford yesterday we called in at Hidcote Manor Garden, regarded as one of England’s great gardens. It was the lifelong passion of self-taught gardener Lawrence Johnston who created his ‘garden of rooms’ in the Arts and Crafts style. being so close to Stratford (though over the border in the Gloucestershire Cotswolds) we were able to get there for opening time and experienced a usually busy garden in peace and tranquillity. Lawrence Johnston was an American who came to England to study at Cambridge University. His mother had bought Hidcote in 1907 and Johnston spent 41 years creating what would become one of England’s most influential 20th-century gardens. 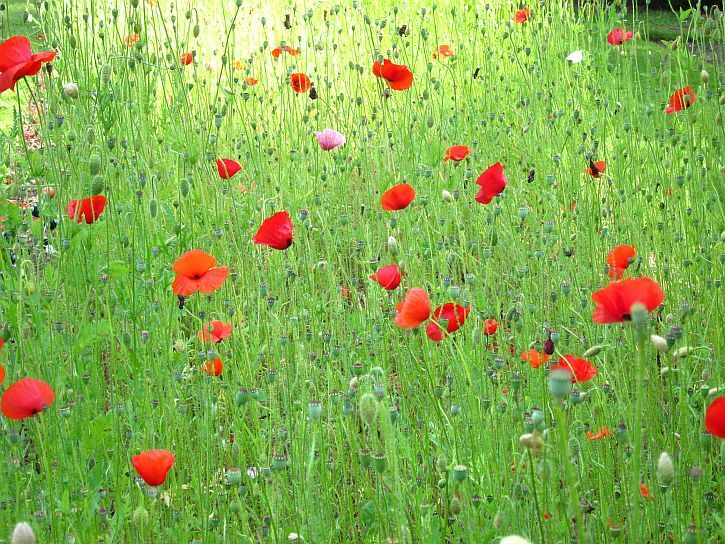 He became interested in making a garden out of the fields surrounding the house. It’s a beautiful garden to wander in, with new vistas opening up constantly as you move from one outdoor ‘room’ to another through archways in high yew hedges and along winding paths. The small chapel building in the courtyard at the entrance (above) was never consecrated: the wisteria must be spectacular in the spring. The Old Garden was probably the first of Johnston’s plantings and is dominated by the cedar of Lebanon (above). Johnston designed Hidcote as a series of outdoor ‘rooms’, which combine masses of colour with traditional garden crafts such as topiary. Each room has its own distinct atmosphere and character. The hedges that divide the rooms were designed to compensate for the plot’s exposed aspect. Johnston planted hedges of holly, beech, hornbeam and yew for shelter and structure. Another key feature of Johnston’s scheme is the Red Borders (below) which incorporates all kinds of red and orange flowers, as well as purple foliage for contrast. The Beech Walk (below) was planted by Johnston to protect the garden from the damaging north-westerly winds. It is now a fully-mature cathedral nave of beech trees. There’s an orchard, as well as an extensive kitchen garden (with a huge pumpkin patch). The gardens are so extensive that can be difficult working out whether you’ve seen everything. There’s a garden of Japanese maples, an alpine terrace, a garden with a circular bathing pool, and a series of gardens that follow the winding course of a stream. There’s a ‘wild garden’ called The Wilderness and The Long Walk – an extended grassy walk bordered by hedges, with twin gazebos at one end and superb views across the surrounding Cotswold countryside at the other. And if you have a snack at the outdoor cafe tables, you’ll find the sparrows are very attentive! 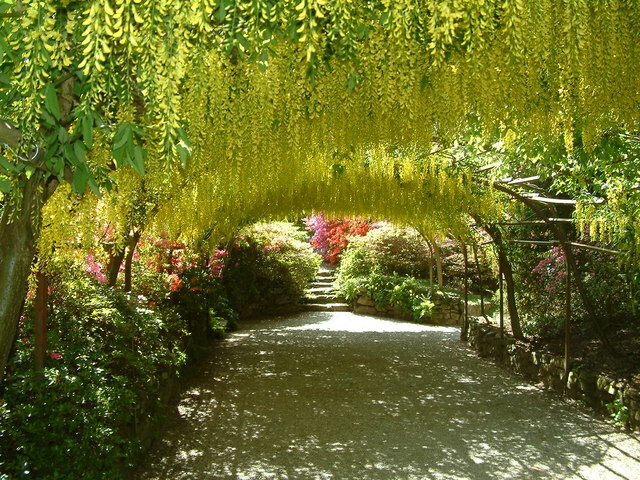 In 1948, Johnston gave his garden to the National Trust. For the next few decades, the National Trust struggled to maintain the original Arts and Crafts style of the garden on limited funds. Several of the garden rooms became somewhat overgrown, and some of Johnston’s original plant specimens had to be replaced. Recently, following a major donation, the Trust has been able to begin to return the gardens to their original state, and Hidcote has become one of the most popular destinations on garden tours and tours of the Cotswolds. BBC 4 showed a documentary telling the story of Hidcote – the most influential English garden of the 20th century – and Lawrence Johnston, the enigmatic genius behind it. Hidcote was the first garden ever taken on by the National Trust, who spent 3.5 million pounds in a major programme of restoration. This included researching Johnston’s original vision, which in turn uncovered the compelling story of how Johnston created such an iconic garden. Until recently, little was known about the secretive and self-taught Johnston. The documentary told how, in 1907, Johnston’s mother bought Hidcote Manor and Johnston began a programme of 40 years’ work on its gardens. Here, beginning tentatively before 1914, and more confidently after after being wounded in the First World War, Johnston combined a feeling for structure (creating a surprising series of discrete spaces) with a love of plants and a willingness to experiment with novel plant-combinations. 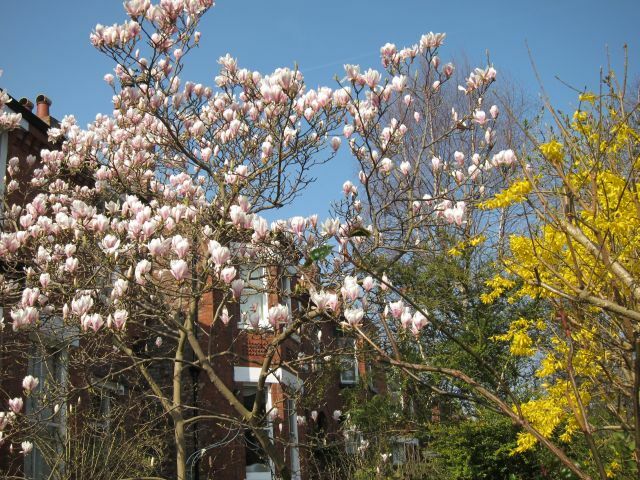 An enthusiastic plant collector, he sponsored or undertook several expeditions in Europe, Asia, Africa and South America to bring back rare specimens. In 1924 Johnston bought Serre de la Madone, near Menton, on the Mediterranean coast of France; and from then on would spend most of the year at Menton and a few summer months at Hidcote. At Serre de la Madone he turned terraces of vines and olives into a garden notable for its design and rare plantings of sub-tropical plants. He kept few, if any, records on Hidcote’s construction, but current head gardener Glyn Jones made it a personal mission to discover as much about the man as possible to reveal how, in the early 20th century, Johnston set about creating a garden that has inspired designers all over the world. Tonight we went to Ness Gardens for the light display, Illuminess. The gardens were illuminated by solar powered lights and bio-fuelled generatorsto produce rather beautiful and mysterious displays. Here are some photos that give an impression of the effects.